Climate Change Through the Ages. Grade school earth science taught us that rocks get pummeled into smaller bits through freezes and thaws, erosion, wind, and gravity. Eventually reaching the size of bacterially digestible powder, the minerals of the rocks are then released into biologically necessary soil amendments. Usurped by plant roots and incorporated into the living layer on the surface of our planet, we end up with what is known as dirt. Spreading some garden limestone powder over our lawn is a common practice. Let us take this simple landscaping technique and ramp it up to an epic scale. Ice ages, which send glaciers over vast stretches of our continental landmasses, routinely cycle through our weather patterns in time frames lasting hundreds of thousands of years. The ‘inter-glacial’ period we are now enjoying usually lasts for ten to twelve thousand years. We are now into year eleven thousand of our vacation from the glaciers. Leading into the ice ages, vast amounts of moisture are deposited onto sheets of ice over the poles by storms brewed in equatorial regions. This ice, recognized as glaciers, slowly moves downhill, grinding the bedrock into smaller pieces. (Liquid water run-off from modern day glaciers is called ‘glacial milk’, and is considered very nutritious.) So much moisture is locked into the glaciers that much of the Earth is very dry; sea levels drop hundreds of feet. As the glacial rock dust spews into the wind, it is spread over the planet, fertilizing the soil, muddying the glaciers, and eventually bringing the ice age to another inter-glacial respite. What we call ‘global warming’ is merely the precursor to ‘climate change,’ which will be the next glaciation. The human-exacerbated amounts of greenhouse gases in the atmosphere provoke weather responses that we recognize as gradually stronger storms. The near-term of a changing climate will be seen as a warming trend, even melting the Arctic icecap, disrupting weather patterns, dislodging even more violent storms upon a now matured civilization. What we experience as routine weather is merely the calm between the normalcy of severer storms. Humanity can make a difference in the foregone conclusion of climate cycles by managing the amounts of greenhouse gases stockpiled in the air we breathe. Sequestering carbon by making compost or bio-char is a practice used by many gardeners. Use rock dust fertilizers to emulate the best of a portending disaster. Spread some greensand, (a potassium rich fertilizer), locally mined rock phosphate, limestone, and mineral accumulating seaweed on the garden to accelerate plant growth. We have spurred on our imminently unhappy climate coda, but we can also eschew its eventual outcome. Weather that only a gardener could love (we hope). Click this link to ‘Put some South in your mouth’. Collard Greens are the best! Put some South in your mouth: Collard Greens are the best! Collards are a photosynthesis machine. Not one to wait for flower, fruit, seed, or root development; collards produce the food we need without any distractions. And they taste great. To get the most from all your efforts, harvesting is as important as planting, watering, or fertilizing. Here’s an article I actually spent time writing for the Simple Living Institute’s Central Florida Food Guide. The Food Guide is a carbon based paper booklet available around town describing various venues. with a few multi-seasonal exceptions (kale, collards, herbs). 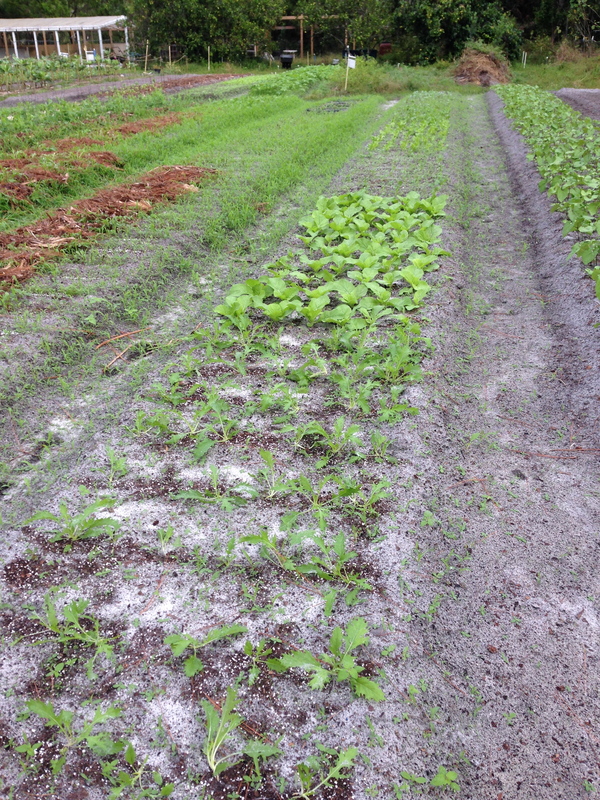 Very few perennial (food forest) crops will grow here in the Orlando/Central Florida area (sorry Permies). 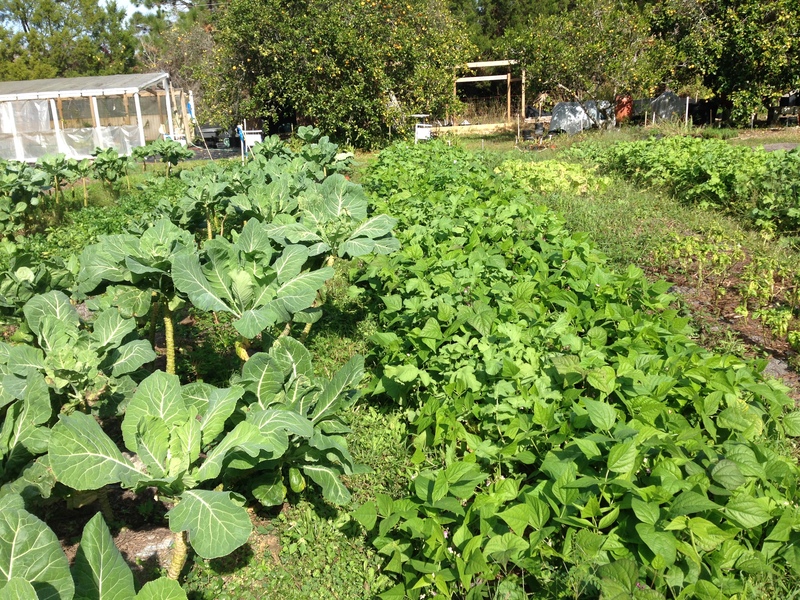 If you would like to learn more about gardening in Florida, or the Sundew Gardens upick ‘Harvest Gardening’ CSA, please plan to attend our free weekly tours, offered every Friday and Saturday at Noon. Hope to see you in the garden! Although homesteaders in Central Florida do not experience the extremes of seasonal change as do our cousins in temperate latitudes, recognizing and respecting the palette of weather conditions Mother Earth dishes out over the course of a year will help us on our way to becoming more productive in our self reliant endeavors. Consider gardeners living under a climate that encounters snow every Winter; their off-season is well defined, pest control is assured, weed pressures are capped under a frozen blanket. In contrast, our off-season is an extension of the not cold Spring merely sweating into Summer, cooled only by random thunderstorms. Yes, we can grow crops in the Summer’s jungle-esque humidity, hyper-growth weeds, wack-a-mole pests, and the ever present danger of random ground stroke lightning bolts, but any lurking productivity is easily thwarted. And then one week in mid-September, coincidentally around the celestial Equinox, we overlook the missed storms but temperatures still peg out under 90F. Time to start gardening, non-stop until 4th of July! To get a head start on the outdoor growing seasons, prepare seedlings and transplants in a greenhouse space in mid-August beginning with cherry tomatoes, then greens, salad fixings, herbs, scallion onions. Do not start peppers, squash, or eggplant; there is not enough time before the shorter days and cooler nights of later Autumn which will damage them before harvest. And pest populations are at their maximum. Hopefully over the Summer, the garden site was protected from rampant weed growth with an impenetrable layer of cardboard, newspaper, and/or mulch. Muck out the site leaving only soil, then till/turn/double-dig and achieve a finished grade. Start Autumn crops by planting bean, carrot, beet, and radish seeds to the garden soil. Once directly seeded crops are on their way to germinating, start transplanting seedlings, starting with tomatoes. Counting backwards from our inevitable Christmas frost/freeze/coldsnap should mark up our growing calendars significantly. Beans take 60 days during the longer nights of November, so plant them no later than Halloween (but I always do). The cherry tomatoes will start to ripen around Thanksgiving. Most of the cool-season crops that grow during Autumn/Winter/early-Spring will tolerate almost any low temperatures heading our way. Profusely re-plant them all; waves of carrots, the next batch of beets, a never-ending stream of radishes. To upset soil pests, thoroughly till/turn/double-dig growing areas after each harvest and leave the plot fallow between crops for as long as possible. Keep the longevity of the crop in mind. Heading crops like lettuce or Asian greens (Pac Choi, Mizuna) are harvested whole, tying up space for only a few weeks. 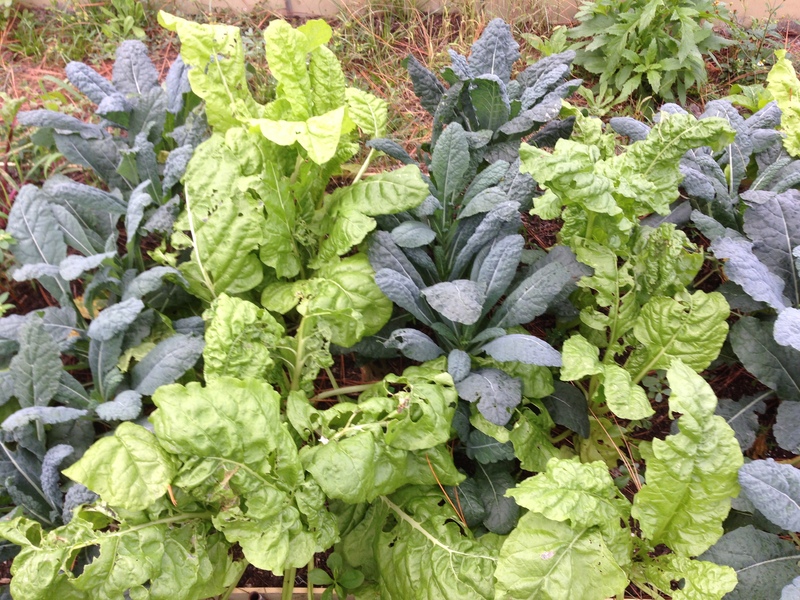 Collards and Dinosaur kale started as seedlings in September, transplanted in October, thinned in November, and enjoyed for Thanksgiving might still be included in a Memorial Day coleslaw recipe. Covering plants with blankets during a cold snap will effectively protect cool season crops, but beans and tomatoes subject to stunting cold, if not from this cold front, then the next or the next, will no longer thrive. Tomatoes grown up a trellis, covered with sheets and blankets in a raging cold front, will sail beyond any hope of repair. Harvest the fruit and welcome the next crop. Always adjacent with frontal weather and its signaling wind is the following night of dead calm star-filled freezing skies. Right after the Holidays is the time to start transplants for Spring. It is hard work to get tomatoes, eggplant, peppers, cucumbers, squash, basil, zinnias germinated in the chilly weeks surrounding Winter Solstice. Heat and lighting requirements to start seedlings are a show stopper until a dollop of handyman construction is invested. Saint Patrik’s Day is approximately the last frost date I have ever experienced. Pest prone cucumber and squash will now have a chance with bug populations reduced after Winter. Tomatoes, peppers, and eggplant transplants will thrive as the days get warmer and longer. Plant batches of beans until Summer heat throttles them back. The cool season crops will start to sputter as April does not rain until May, if even then. I shoot for 4th of July to maintain the spectrum of crops already growing. Tomato plants will die from the bottom up; once the tops stop setting new fruit, harvest any lagging fruit as it shows the slightest sign of ripened color. Summer is our off-season; maybe nurture a few surviving eggplant, peppers, or herbs. A fallow period controls many soil conditions. And a little down time for the gardener never hurts either.